I recently discovered — and fell in love with — Fantasy Flight‘s new Star Wars X-wing Miniatures Game. I discovered the game via Wil Wheaton’s YouTube show, Tabletop. The game is absolutely fantastic, and all the gaming stores in my city have been having trouble keeping the game and the expansion sets stocked. It’s easy to learn, fast to play, has tactical depth, and uses absolutely awesome miniatures! I can’t say enough about how good this game is. The only downside is that it’s expensive. The core game costs $40 and you get one X-wing and two TIE Fighters with it. Each additional fighter (X-Wing, Y-Wing, TIE Fighter, TIE Interceptor, etc.) 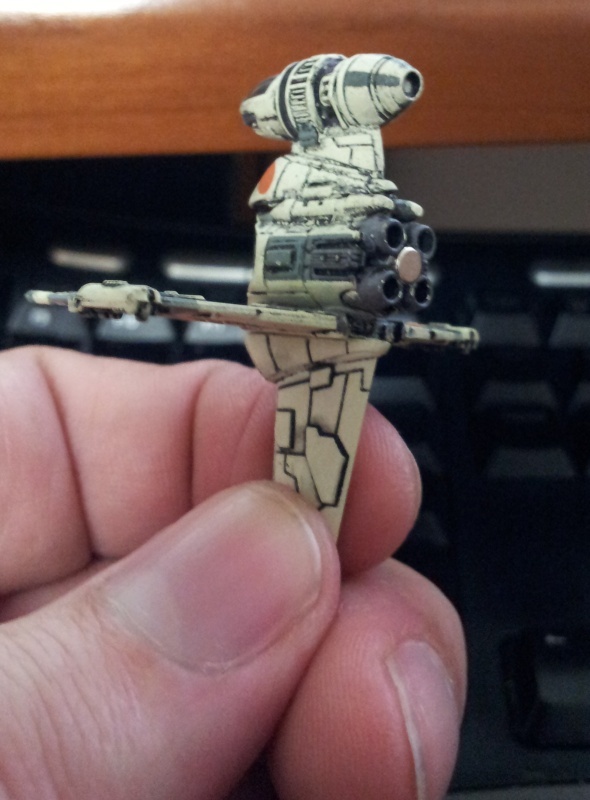 is $15, and the larger ships (Millennium Falcon, Slave I, etc.) are $30. To get enough miniatures to play a full, 100-point game (that’s a game where each side fields 100-points worth of ships; the different ships and their pilots and upgrades have differing point values, and you mix-and-match them to get to 100 points when preparing your team) will cost you at least another $60, minimum. So, for an initial outlay of $100 or so you get the core game plus enough expansion ships to make for a full play experience. However, the price is really worth it. The level of quality in the parts is extremely high — probably the highest I’ve ever seen for a game. 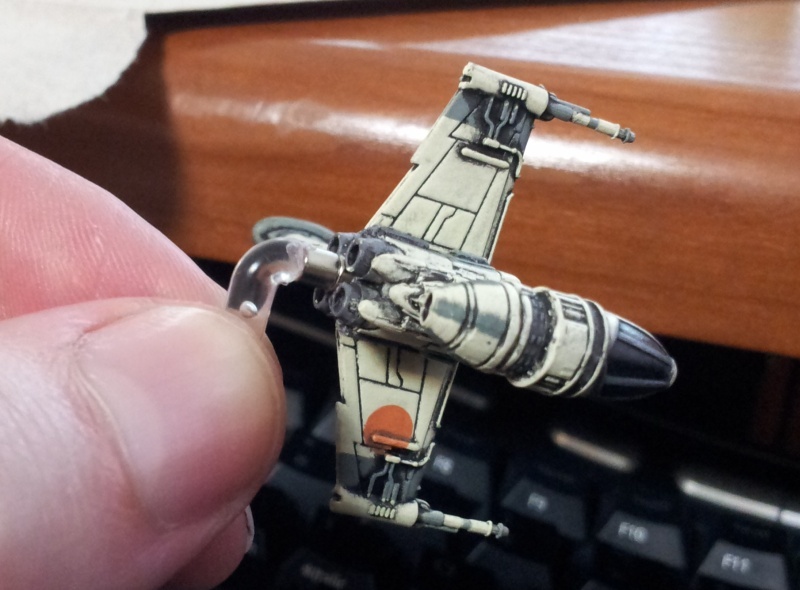 Anyway, I mainly wanted to show off my modification to the B-wing fighter miniatures I bought. They B-wing fighter has a lopsided body with the cockpit off to one side. 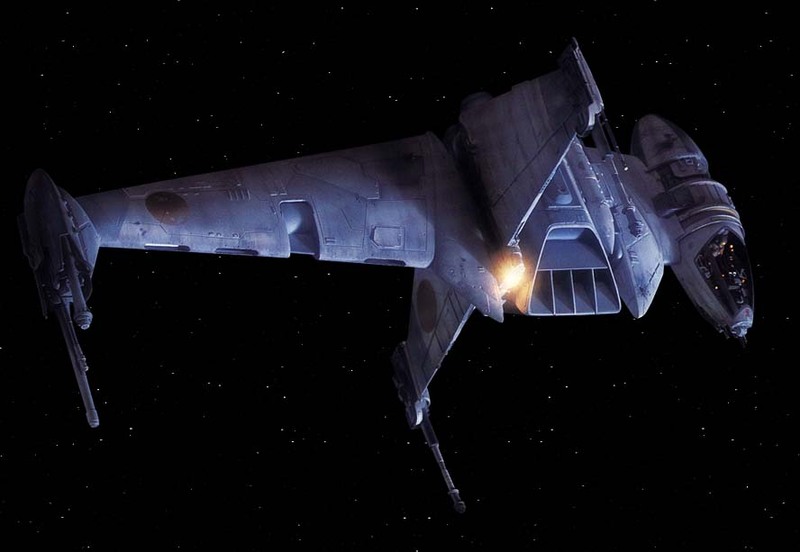 In the Star Wars universe, the cockpit of the B-wing is set in ring that allows it to rotate to any orientation. 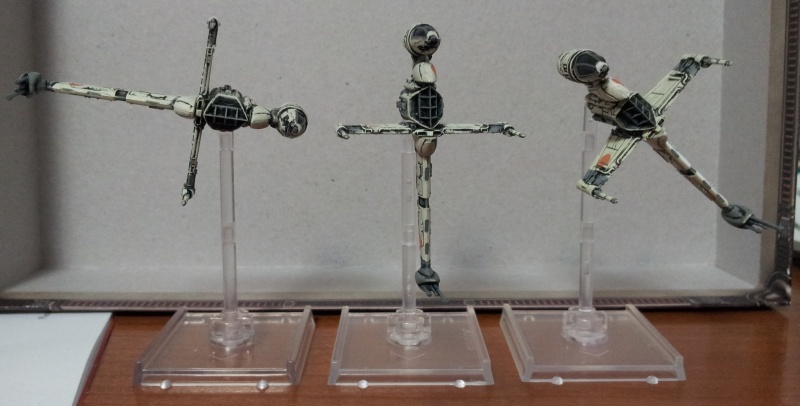 Typically you see B-Wings with the main body in a lateral position, but the B-wing minis that you can get this game have the body in an upright position. I came across an idea somewhere about how to modify the miniature to allow you to rotate the ship into any position you want, and today I made that modification to all my B-wings. The first thing I did was to twist off the clear plastic peg that it attached to the ship, which you use to mount it onto the miniature stand. Some people do this and just glue the peg back on after rotating it 90°, which puts the ship into the classic sideways orientation. 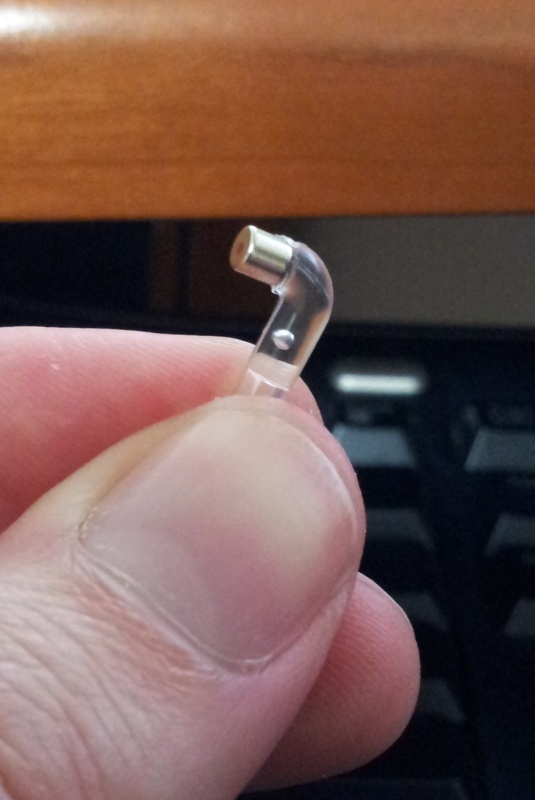 What I did, instead, was to drill out a small hole into where the peg broke off and then hot glue a 1/8″ neodymium rod magnet into the hole so that it was about flush with the back of the ship. 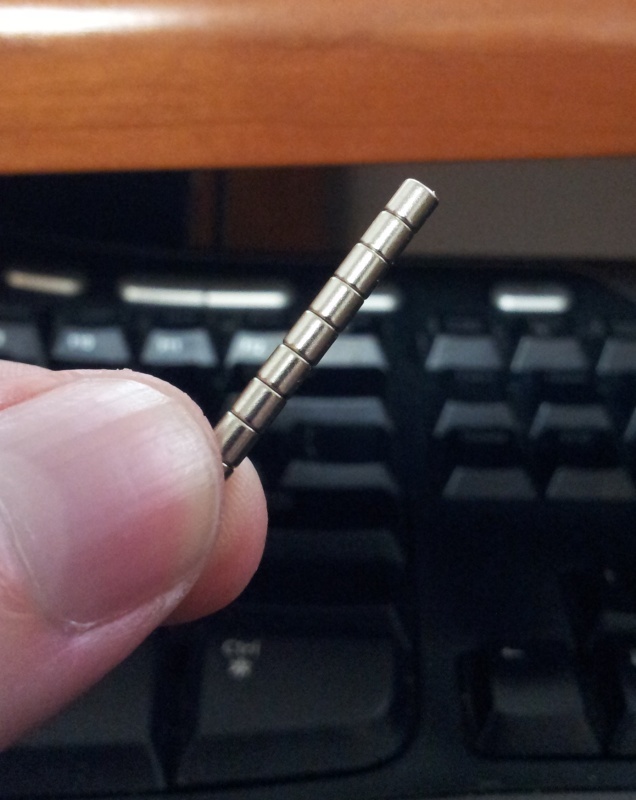 I glued another identical magnet to the peg I removed earlier and, voila! 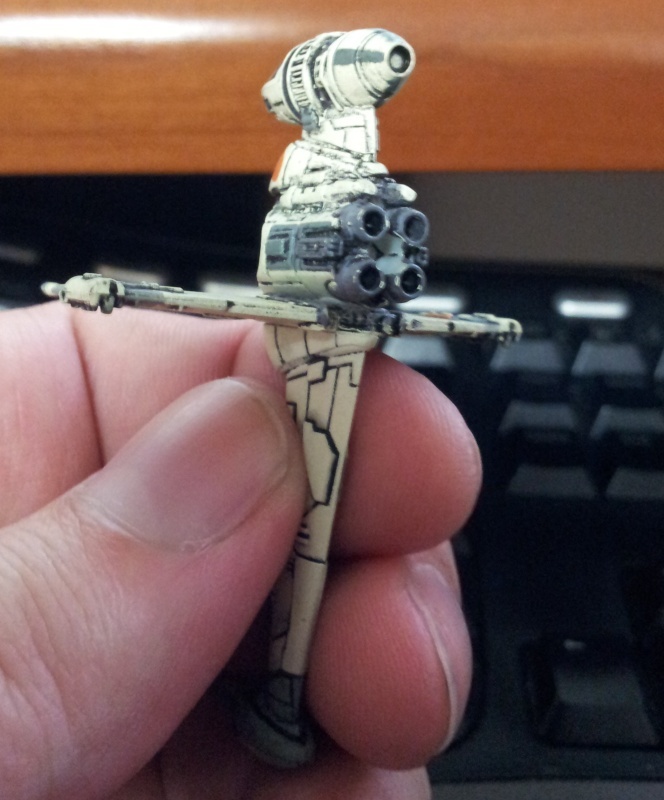 I now had a B-wing miniature that could rotate a full 360° about its longitudinal axis. The rare earth magnets are strong enough to keep the ship in whatever position one might see fit to place the B-wing. I suppose one could apply the same modification to the cockpit in order to allow it to rotate as well, but that’s a detail I’m not going to worry about.